A Delhi court today sentenced four persons, including Jamia Millia Islamia University teachers and a former JNU professor, to imprisonment of various terms for running a fake medical college and duping students of lakhs of rupees. The BJP has termed the professional tax in the MCD budget as another case of cheating the common man and a violation of the commitments of the Congress government. Did the use of a mobile phone by the driver of a bus lead to the accident that claimed the lives of six passengers in the Palwal sub-division of the district recently? With the arrest of four persons, the Delhi Police claimed to have busted a gang of notorious thieves and recovered 271 colour television sets worth Rs 55 lakh from their possession. The Narcotics Branch of Delhi Police has seized 4,000 injections of Bupermorphine and arrested two persons in this connection. A Chinese national was today sentenced to eight months’ imprisonment and fined Rs 1,000 by a Delhi court for staying illegally in the country. An advocate and the former President of the Bar Association of Palwal town in the district was shot dead by two motorcycle-borne assailants this morning. As many as 575 dengue cases with three deaths and 605 malaria cases have been reported after July this year, Parliament was informed today. The Academics for Action and Development (AAD) has alleged that the Vice-Chancellor of Delhi University has “tampered” with the electoral list for the forthcoming elections to choose the teachers representatives to both the Academic and Executive Council. The local civic administration seems to be ignorant of the illegal building activity that is going on in various parts of the city. The Commissioner of Gurgaon Division, Mr Gulab Singh Sorot, has placed under suspension a Nayab Tehsildar of Sohna. More than 5,000 auto rickshaw drivers have been challaned for various offences during the special drive launched by the Delhi Traffic police. Natasha Jain, the youngest human rights activist of India, received ‘Srishti Award’ from Mrs Sheila Dikshit, Chief Minister of Delhi, in a function organised by a Hindi newspaper, GTB Times, at Hindi Bhawan in the Capital. Chief Metropolitan Magistrate Reena Singh Nag further directed the SRM Educational Society, which established the said college at Noida, to pay a compensation of Rs 2 lakh to 60 students who had lost their valuable time and money while pursuing the ‘MBBS’ course in the unrecognised institution. While the four accused — Riaz Muneer, former JNU professor, Syed Jamaluddin, a qualified Unani doctor, Kamleshwar Pandey from the Mass Media Department at Jamia, and Waquar Hussain, a lecturer in graphic designing — were put on trial, two others, Dr I H Naqvi and Dr Satosh Rai, are absconding. The New Friends Colony Police investigated the case on a complaint by one Hussain Aqueel who had paid over Rs 3 lakh to get admission in the college. The police said the accused, who were in the management team, used to lure students by giving advertisements in various newspapers. They falsely represented to the unsuspecting students that the college was recognised by the Indian Medical Council. in Uttar Pradesh. They showed the proposed building plans to attract students and admitted 47 of them in the 1999-2000 batch and 13 in 2000-2001 batch, the police said. To ward off suspicion by students, the accused even conducted an examination for a semester. While the CMM sentenced Riaz Muneer to RI for seven years and imposed a fine of Rs 1 lakh on him, Syed Jamaluddin and Kamleshwar Pandey got five-year terms and have to cough up a fine of Rs 50,000 each; Waquar Hussain has been sentenced to RI for three years and has to pay a fine of Rs 10,000. With the arrest of three accused, the west district police have worked out seven cases of cheating and theft, and recovered jewellery and articles worth Rs 3 lakh from their possession. The accused have been identified as Nathu Ram, Sonu and Arjun. The police said that the incidents of thefts have increased recently in Rajouri Garden, Tilak Nagar, Hari Nagar and Moti Nagar. During interrogation, the accused disclosed that they would target well-to-do old women. The seized goods include five bangles, five rings, six chains, three pairs of ear-tops, three pairs of earring and a gold nugget. In a statement released today, Delhi Pradesh BJP president Dr Harsh Vardhan said that the chairman of the standing committee had announced that professional tax would not be implemented, but the MCD commissioner has thrust upon this professional tax in the budget proposals of 2005-2006. He pointed out that as per the provisions of the professional tax, even a rickshaw puller had not been spared. “In view of vehement opposition from the masses, now the commissioner of the MCD has stated that it would be levied on the people earning a monthly salary of Rs 30,000 or more. Such people will have to pay a minimum tax of Rs 1,200 and maximum Rs 2,500. With this tax, the corporation intends to corner Rs 2,600 crore,” he said in the statement. The secretary general of Confederation of All India Traders, Mr Praveen Khandelwal, said that the professional tax imposed on the traders, salaried class and people travelling from the satellite towns to Delhi for earning a livelihood was against the basic principle of Value Added tax (VAT). It is an attempt by the MCD to cross its ambit and is contrary to the principle of welfare state. It is also against the concept of NCR since lakhs of people coming from NCR will be liable to pay professional tax, Mr Khandelwal said. Did the use of a mobile phone by the driver of a bus lead to the accident that claimed the lives of six passengers in the Palwal sub-division of the district recently? This question is haunting the injured and the kin of the deceased, who were among the members of a marriage party returning to their village. The festivities turned into a nightmare not only for one Hari Singh, whose son had got married that day, but also for the entire village; six villagers, including a 12-year-old boy, died in the mishap. It is reported that the hired private bus hired was carrying around 40 passengers; it was a few kms away from the village when the driver lost control and the vehicle overturned after climbing the footpath on Wednesday evening. The driver had reportedly been using his cellphone when the accident took place. Sources said that the alleged use of mobile by the driver was discussed by the villagers at the cremation of the deceased yesterday. It is learnt that some of the passengers had also objected to the use of the mobile, but the driver, who is stated to be absconding, overruled them. The bus overturned when the driver tried to avoid a head-on collusion with a car coming from the opposite direction, an injured passenger told the police. While five persons — identified as Jagbir, Totaram, Mahipal, Dharampal and 12-year-old Dheeraj — died on the spot, an injured Des Raj succumbed to his injuries last night in the hospital. About ten others, including a minor boy and a girl, were injured in the accident. The police has booked a case against the driver of the bus. . Meanwhile, three persons, including a woman, have been killed in different accidents in the district in the last 48 hours. One Manoj Tripathi of Sanjay colony here was killed after his motorcycle met with an accident near Kelly village. In another case, a woman identified as Chandra Devi, who was hit by a speeding car near Mitrol village, succumbed to her injuries in the hospital. In yet another case, an unidentified person was also killed in a similar accident. With the arrest of four persons, the Delhi Police claimed to have busted a gang of notorious thieves and recovered 271 colour television sets worth Rs 55 lakh from their possession. The accused have been identified as Ajayab Singh (26), Ajay Verma (40), Ashok Kumar (26) and Ajit (24). 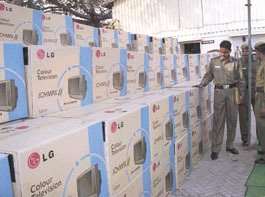 The police got a tip-off from one Rajender Singh, who made a complaint with the Okhla police station that he had hired a container for LG Electronics on November 17, in which 272 LG televisions were loaded. But the container did not reach the destined spot at ICD Tughlaqabad. During investigation, the police traced out the driver of the container, Ajayab Singh and at his instance the other accused allegedly involved in committing the crime. During interrogation, he revealed that on November 17, he had met with four accused Ajay Verma, Vakeel Ahmed, Ashok, Ajeet, who lured him for their plan to rob the container with his connivance. They had also promised him to pay a good amount for this. In token money, the driver was given Rs 50,000 advance. During further interrogation, it was revealed that the four accused were earlier also involved in similar cases in the Okhla area. One of the accused Vakil Ahmed is at large. The accused have been identified as Dr Pankaj Aggarwal and Sheel Kumar Tyagi, both are the residents of Ghaziabad. Police said that Dr Pankaj Aggarwal completed his BAMS and his father was running a medical store in Ghaziabad. The licence of the store had expired three years back, but they had not got it renewed, the police added. The injections are drug-based. The cost of an injection has been estimated to be around Rs 25-30. In another case, the police have seized one kg of fine quality heroin and arrested two persons. The accused have been identified as Mohammed Rauf and Melu Ram. The police arrested the duo from Nand Nagri area last night. Melu Ram has seven children and found it hard to make ends meet. He entered the crime world. His wife is also in jail under NDPS Act, the police added. In another case, the police have seized 280 grams of heroin and arrested one Mohammed Alam from Shastri Park area. The accused used to sell helmets in Jama Masjid area, but later started selling heroin in pouches. Additional Chief Metropolitan Magistrate Madhu Jain also ordered the deportation of convict Tenzing, found guilty of violating the provisions of Foreigners Act. However, the court set off the period of sentence against the term that he has already undergone in judicial custody during the trial. Tenzing would be set free once he pays the fine, in default of which he will have to be in jail for another 15 days. He was arrested in the evening of March 26 this year from ‘burfkhana’, an ice factory near Sabzi Mandi police station as he was without valid passport and visa, police said. Though Tenzing claimed before court that he was from Tibet and has been just implicated by the police, the court said he did not have documents to prove it. Prosecution examined four witnesses to prove its case. Assistant Sub-Inspector Karan Singh and Constable Viju in their testimony told the court that when they interrogated Tenzing, he told them that he was a Chinese national and had entered the country via Nepal and was staying in Majnu ka Tila in North Delhi. The police also said that Tenzing did not have any valid documents of the bike he was riding at the time of arrest. “There is no reason to disbelieve the testimony of the police personnel.… Prosecution has been able to prove its case beyond reasonable doubt,” the court said. An advocate and the former President of the Bar Association of Palwal town in the district was shot dead by two motorcycle-borne assailants this morning. This led to widespread resentment among the lawyers, who went on a strike today in protest against the killing. The majority of shopkeepers in the town also kept their shutters down. The incident occurred when the deceased, identified as Ch Narvir Singh (50), residing in the New Colony area of Palwal, was coming from a nearby cremation ground. Two youths riding a black coloured motorcycle, intercepted him and fired from a close range. It is learnt that two bullets were fired from a revolver and Mr Singh fell down on the ground as he was hit on his head. The incident took place around 7 am. Later, the victim succumbed to his injuries before he could be rushed to the hospital. It is reported that the main cause behind the murder could be an old enmity between two groups over the ownership over some land. It is stated that the victim had received some threats in the recent past and according to his kin the police did not take the matter seriously and failed to provide him any security. The murder sparked protest among the lawyer community at Palwal, who announced to go on strike demanding immediate arrest of the culprits. Shops in many parts of Palwal also remained closed. The police has registered a case. As many as 575 dengue cases with three deaths and 605 malaria cases have been reported after July this year, Parliament was informed today. However, there has been no abnormal increase in dengue and malaria cases this year over the previous years, Minister of State for Health Panabaka Lakshmi said in a written reply. Defibrillators: Safdarjung Hospital has placed orders for procurement of eight more defibrillators, the minister said. “There is no report of death due to lack of defibrillators in Dr Ram Manohar Lohia Hospital and Safdarjung Hospital,” she said. At present, the ICCUs in Safdarjung Hospital and Lohia Hospital have one and 10 defibrillators, respectively, in addition to four in ICU, four in main operation theatre, and one each in plastic/eye and gynae operation theatre. CGHS Dispensaries: No dispensary will be opened at Vikaspuri and West Enclave at present due to constraints of resources and manpower, Ms Lakshmi said. The dispensaries at Darya Ganj and Pul Bangash are not functioning as the buildings are under renovation. AIIMS Research: The Research Committee and the Research Review Committee have been reconstituted at AIIMS, and the meeting is scheduled to be held in January-February next year. The Research Review Committee, to review the research projects, could not meet during the past five years due to some administrative problems, the minister said. Milk Booths: Only four all day milk booths in Sarojini Nagar, Kidwai Nagar, Netaji Nagar and Lakshmibai Nagar have electricity connection. For the remaining booths, NDMC has been requested to provide electricity connection on priority basis, Minister of State for Agriculture Kantilal Bhuria said. In a statement issued here today, the AAD Chairman, Dr S. S. Rathi, has alleged that the list has left out the names of several full-time as well as part-time teachers and those on the ad hoc basis. This, the AAD claims, is in violation of the 1974 judgement of the Delhi High Court regarding the electoral list for the Academic Council. The judgement had said that all teachers, part-time as well as ad-hoc along with the permanent teachers of DU, constitute the electorate and their names must find a place on the list. Dr Rathi in his statement said that no efforts have been made by Vice-Chancellor Prof Deepak Nayar’s office to include the names of permanent teachers whose names have been dropped. The principal of Jesus and Mary College, in which institution the names of some permanent staff have not been included, has also reportedly written to the VC on this count. Vice-Chancellor of Delhi University Prof Deepak Nayyar has been elected the Vice-President of the International Association of Universities. The International Association of Universities based at UNESCO in Paris, was established in 1950 and is a premier association for universities across the world. The local civic administration seems to be ignorant of the illegal building activity that is going on in various parts of the city. A legal notice has been slapped on the authorities of the Municipal Corporation Faridabad (MCF) for alleged violation of the ‘Zoning Plan’ approved by the state government. It has been called upon to either stop such an activity effectively or face legal action. The notice has been given by a local social activist, Mr Krishan Lal Gera, through his advocate, Mr Joginder Prasad Singla, to the Secretary, Town and Country Planning Department, Government of Haryana, Commissioner MCF and the Deputy Commissioner, Faridabad, stating that there has been extensive violation of the Zoning Plan by the builder mafia here. It has been claimed that the mafia has been constructing multiple residential units in the plots, which were meant for a single unit only and selling these to people who were ignorant of such violations. It is alleged that involvement of certain officials of the civic body and the office of the Registering authority had perhaps made this ‘activity’ easier, as the builders and property dealers had been facilitating the registry of such floors to the occupants, which otherwise was grossly illegal and misleading. Citing the example of Sector-10 and 11 here, which were carved out originally by the DLF (a private builder) and later handed over to the Municipal Corporation, the notice has claimed that these sectors had been carved according to the provisions of the Punjab Roads and Control Areas Act, 1963, and Rules, 1965. As per the Zoning Plan prepared and passed by the Department of the Town and Country Planing, plots having measuring 250, 500 and 1000 sq. yards were meant for single independent units and civic amenities like sewer lines, roads and water pipelines had been laid according to the requirement of such units. But it is stated that the civic infrastructure could collapse, if the administration allowed it. It is added that while the builders and colonisers had no approval for construction of multiple units, the ‘failure’ of the civic authorities to take proper action spoke about the ‘unholy’ nexus and malfunctioning of the office itself. It has been pointed out that the ‘land mafia’ was submitting one composite map of the building for approval and was passing on a copy each to the occupants of the floors, sold independently. It is stated that the size of the water and sewer line laid here was of only 3” and 6” diameter only. The action against the official, Mr Abdullah Khan, follows a raid by the Sub-Division Magistrate, Sohna, Mr Vivek Padam Singh, on the office of Tehsildar at Sohna, where the accused was allegedly effecting registries of land after office hours, a few days ago. Incidentally, the accused as well as some underlings of his office decamped when they got the wind of the raid. Mr Sorot confirmed of the action against the officer. According to him, there were allegations from various quarters of the public being harassed by the officer. According to sources, the authorities had been receiving complaints from the public that Mr Khan used to adopt dilatory tactics in his official work, even for routine matters, causing hardships to them. In the raid, the SDM allegedly found incriminating evidence against the tehsildar. More than 5,000 auto rickshaw drivers have been challaned for various offences during the special drive launched by the Delhi Traffic police. While 2,500 auto rickshaw drivers were challaned for not wearing proper uniform, 700 were caught for over charging, 150 for driving without a proper valid licence and another 50 for driving without the mandatory badge. Delhi Traffic Police spokesman said that the drive which started a few days ago will continue. He warned the auto rickshaw drivers to adhere to rules or else face action, including impounding of their vehicles. Mr. Qamar Ahmed, Joint Commissioner of Police, Traffic, said that each traffic circle in the National Capital Territory of Delhi has constituted a special team that carries out surprise checks of auto rickshaws. The other awardees were: Mr Talwant Singh, ADJ; Dr T N Mishra, ex-CBI director; Mrs Prem Lata Garg, Principal, DAV School Shresth Vihar; Mr Umesh Sachdeva, Ex. Engineer, MCD; Mr A C Varshneya, S E PWD; Mr Mahendra Sharma, Chief Sub-Editor, Hindustan; Mr Sanjiv Chouhan, Editor, Sahara Samay TV News; Mr Kamal Sharma, Editor, Navbharat Times; Mr Shanti Bhushan, Editor, Amar Ujala; Mr Dhruv Kumar, Photographer, Dainik, Jagran; Dr Ashok Sharma, Consultant, Apollo Hospital; Lion T David Lal, Director, Saint Mary School.